You are here: Home / Works / UBM Facility Services. INC.
UBM Facility Services, Inc. (UBM) currently serves in excess of 1,000 facilities and employs approximately 2,000 individuals throughout the State of Illinois. UBM is a certified Hispanic owned and operated Minority Business Enterprise (MBE) certified by the City of Chicago and the Chicago Minority Supplier Development Council. Client: UBM Facility Services. Inc.
As a cleaning service company which caters to offices and buildings in the metro, bringing the modern city feel into their brand was the main goal. We had to come up with a design that is innovative and attractive but at the same time also conveys safety and cleanliness. The team enhanced UBM’s logo, giving it a more professional, modern, and brighter look while still retaining the majority of its circular form. 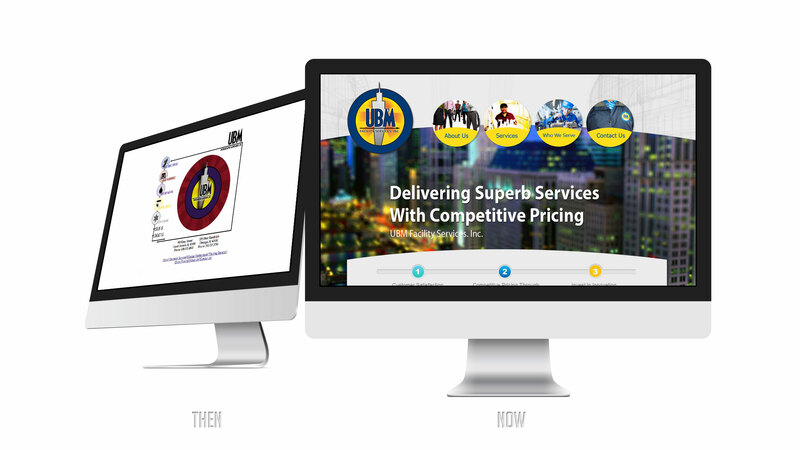 Bearing the creative concept in mind, we designed a website for UBM which is both responsive and engaging. We applied city images in the background to make the site more attractive and relevant to their target. Furthermore, we made sure that every inch of each page looks clean and professional, and easy to navigate through.